Does your head hurt? Do you carry around a bottle of pain reliver at all times? Headaches are common and can stem from a variety of causes. May seek treatment on a daily basis from synthetics from a bottle. Fortunately, there are several home-remedy treatments that help! Try these essential oils to help relieve head and neck tension and discomfort – the natural way! Eucalyptus trees are tall, evergreen trees that grow up to 50 feet in height and are sometimes referred to as Gum Trees. The main chemical components of Eucalyptus radiata are eucalyptol and alpha-terpineol, making it an ideal oil to promote feelings of clear breathing and open airways and for creating a soothing massage experience. Studies have shown that Eucalyptus is effective in helping lessen tension. Lavender has been used and cherished for centuries for its unmistakable aroma and myriad benefits. In ancient times, the Egyptians and Romans used Lavender for bathing, relaxation, cooking, and as a perfume; it is widely used for its calming and relaxing qualities which continue to be Lavender’s most notable qualities. Add to bath water to soak away stress or apply to the temples and the back of the neck. Add a few drops of Lavender to pillows, bedding, or bottoms of feet to promote a restful night’s sleep. Due to Lavender’s versatile properties, it is considered the must-have oil to have on hand at all times. Roman Chamomile grows close to the ground, reaching only up to a foot in height. It has gray-green leaves, flowers that resemble a daisy, and smells like apple. The plant has been nicknamed the “plant’s physician” because it has positive effects on plants growing nearby. Ancient Romans used the oil for courage during war. While the most common use of chamomile is in teas, Roman Chamomile can also be found in face creams, drinks, hair dyes, shampoos, and perfumes. Roman Chamomile has a calming effect on the skin, mind, and body. It soothes body systems. The peppermint plant is a hybrid of watermint and spearmint and was first described by Carl Linneaus in 1753. A high menthol content—like that found in the dōTERRA Peppermint essential oil—distinguishes the best quality Peppermint from other products. Frequently used in toothpaste and chewing gum for oral health, Peppermint also helps to alleviate occasional stomach upset and promotes healthy respiratory function. Peppermint Essential Oil contains a significant amount of menthol. Amongst its many uses, menthol is known to help relax and ease tension headaches and muscular aches and pains. Peppermint Oil is quite stimulating and may interfere with sleeping. Spearmint is a perennial plant that grows 11–40 inches tall and flourishes in temperate climates. It is widely used in gums, candies, and dental products for its minty taste, and to promote fresh breath. Spearmint has been used for centuries for its digestive benefits. Its sweet, refreshing aroma is cleansing and uplifting, making it ideal to evoke a sense of focus and positive mood. Spearmint is very different from Peppermint, making it a milder option to use on children and those with sensitive skin. In cooking, Spearmint is frequently used in salads, drinks, and desserts, but it can also be used in homemade salad dressings and to marinate meats. Like peppermint, but it contains significantly more menthol. Helichrysum italicum is a small perennial herb with narrow, silver leaves and flowers that form a cluster of golden yellow, ball-shaped blossoms. The name “Helichrysum” is derived from the Greek “helios” meaning sun and “chrysos” meaning gold, referring to the color of the flowers. Helichrysum has been used in herbal health practices since ancient Greece and the oil is highly valued and sought after for its many health benefits. Helichrysum is best known for its restorative properties to the skin. Also referred to as the Everlasting or Immortal Flower, Helichrysum is used in anti-aging products for its rejuvenating benefits to the skin. Helichrysum can help reduce the appearance of blemishes, and it promotes a glowing, youthful complexion. Massage into the temples and back of neck for a soothing sensation. 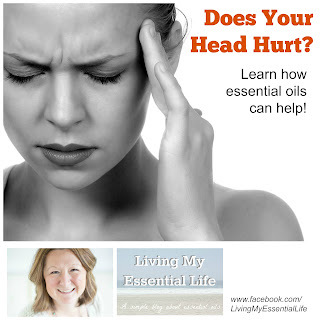 There are several ways you can use the above essential oils to help alleviate head tension. Experience the different ways to see what works best for you. With essential oils, using less is safer and can often be more effective than using more. Remember to always dilute essential oils in carrier oil before applying them to your skin or scalp. Directions: Combine the carrier oil and essential oils into the bottle and gently roll the bottle between your hands to mix. To Use: Roll blend on forehead, back of neck and temples. Don’t forget your feet! There are many different avenues to try for aromatherapy. Place 1-3 drops of your oil blend on either a small cotton ball or tissue and inhale slowly. Select one or more of the above listed essential oils and add several drops to your diffuser by following the manufacturer’s instructions. Be sure to use Peppermint Essential Oil sparingly as its aroma is incredibly strong. Spearmint Essential Oil is also rather strong, but it's typically not as tenacious as Peppermint Essential Oil.